Linux AIO (All In One) project may prove a big blessing for Linux Software testers, developers and web bloggers. It can also be very useful for normal desktop users. As you already know, all Linux distributions support multiple desktop environments, everyone has some favorites, but most of times, you have to try more than one desktop environment on any distribution to decide which one best suits you. Isn’t this time consuming to download multiple desktop environments for same distro and keep installing them? Its not only time consuming, but you spend you network bandwidth, your system resources to carry out this task. This is where Linux AIO Project comes handy; it combines all of the desktop environments available for every popular distribution and wraps them up in a disk image for Live system. You can then burn this image to DVD or a USB drive and boot your system using this, or can use Oracle Virtual Box to create a virtual machine and boot this virtual machine using respective AIO ISO image. Linux AIO project is combined efforts of six developers, details of them could be found here. Currently, the team has provided six compilations as listed below. You can download the ISO compilation of your choice, burn it or boot your virtual machine using this to try out the project. 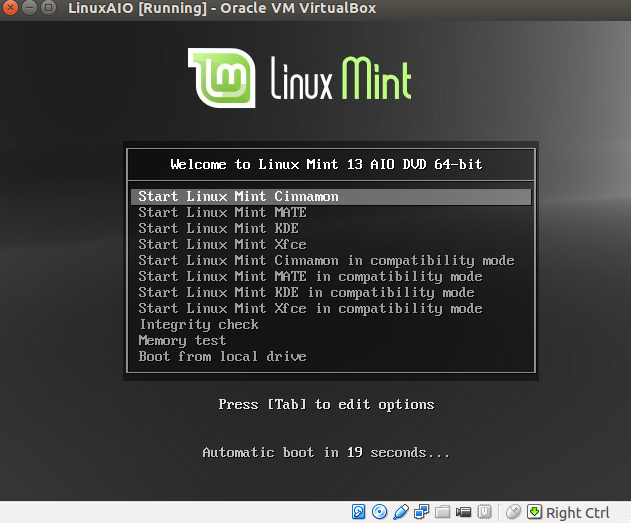 We download Linux Mint ISO and when booted, here is what we see on very first screen. 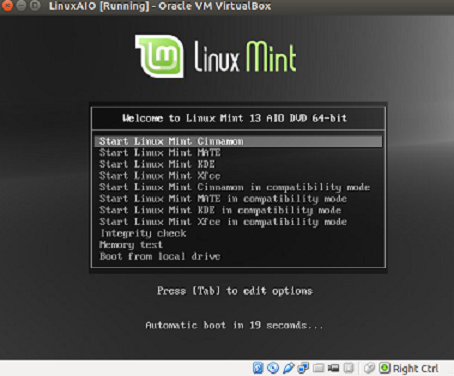 Amazing, it has all available desktop environments for Linux Mint distribution. Another noteworthy feature of this project is that all ISOs are available in both 32 and 64 bit architectures and each ISO contains different versions of same Linux distribution, e.g. Linux Mint AIO ISO contains Linux Mint 17 Cinnamon 32bit, Linux Mint 17 MATE 32bit, Linux Mint 17 KDE 32bit, Linux Mint 17 Xfce 32bit and so on. Linux AIO team is working on adding more and more ISOs to the project. Besides normal desktop Linux users, this project is very useful for professionals, hopefully we should be seeing more news and updates of this project in near future. Would love to see LXDE added to this set! Yup hopefully in near future.. Sounds good idea, have you tried install via network for systems?